Who doesn't love cookie dough? 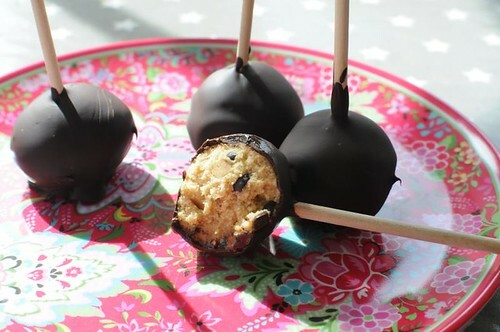 The idea of just eating cookie dough, dipped in chocolate, seemed like heaven. As it turns out... I didn't love it all that much. It was a little too much. So a tip: make these pretty small. And I liked them best when really cold, so keep them in the fridge. Cream the butter and both sugars. Add vanilla, milk and salt, and then finally the flour and chocolate chips. Roll out small balls, and chill until firm. Melt some dark chocolate for dipping, and dip your truffles. You can use popsicle sticks, or just place them in paper cups instead. Whatever you find to be the cutest! Sounds delicious. Is it OK to eat raw flour? Vad tror du om hållbarheten på dessa? Nån vecka+ i kyl? I love this idea, anything with cookie dough is always delicious :) I might try making these for guests this month. I love all your photos and recipes, they look delicious! Det är ngt speciellt med godis på pinne.. det ser bättre ut. Never knew cooking was so easy... or atleast you make it appear so easy.